We created the first affordable touch table solution, with an unique 3 year warranty and our embedded multi user games and content solutions. Our innovative table ordering systems will help increase your sales, boost guest satisfaction, and retain your existing customers, all with simple monthly fees. Seriously. We combine creative design and emerging technology to develop interactive experiences that evolve businesses, blurring the line between the physical and digital world. 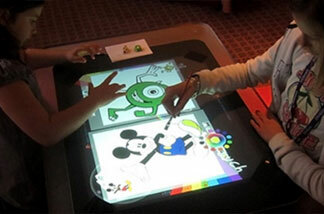 Expert in multi touch table, AFTER-MOUSE.COM uses cutting-edge technology to develop touch and gesture-based applications for businesses across the globe. We have worked across almost every identifiable industry, and have the expertise to develop a solution around the most unique requests. We are an official Premier Partner of Microsoft® and a participant in their TAP programs, MAAP programs, in addition to being a proud member of their Kinect Advisory Council. We are partnered also with 3M, Samsung, Intel, and numerous other industry leaders who trust our expertise and look to us for collaboration, insights and strategic leadership in the development of future technology products and solutions. As part of a widespread European rollout, AFTER-MOUSE.COM developed a three stage custom application for Mazda. The second development phase for Mazda’s rollout included a new Car Configurator application allowing users to customize every aspect of their cars from the interior out. AFTER-MOUSE.COM developed an intuitive, visually stunning presentation application for the launch of the new Hennessy VSOP bottle. The application menu is made of rotating bubbles that showcase information about Hennessy in general as well as details about the VSOP bottle. AFTER-MOUSE.COM’s retail application for Samsung has been featured at trade shows and events across the globe. An exceptional sales tool, this application allows users to explore products through photos, videos and specs, and features object recognition, item carousels and comparison tools. 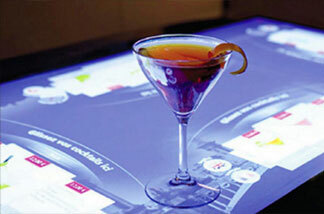 Bacardi asked AFTER-MOUSE.COM to create a touch table application that served as a tool for their mixology students and entertained guests. The application features a create-your-own cocktail component and a rotating carousel of drink options. AFTER-MOUSE.COM created an application for Kaufman, a real-estate development in Germany that features detailed site maps, 3D renderings, interactive brochures and easy accessible floor plans for available units. For the retail super giant Internity, AFTER-MOUSE.COM developed an all-encompassing sales experience. We featured a product catalog that included 3D views and a product comparison tool as well integrated custom loyalty cards to make the checkout process easier. Retail’Move is a motion recognition based application allowing users to discover products in a complete new way, with the simple move of their body: they select the product they would like more information on from the carousel and have access to its detailed product sheets. The product sheets contain pictures, prices and descriptions as well as report statistics based on user feedback. Resto’Touch is an exclusive 4-in-1 hospitality application that enables guests to order food and drinks directly on the unit, along with several other entertaining features. Resto’Touch is for any hospitality setting, allowing up to 4 guests to order their meal directly from the table. Menu items are displayed with a photograph and text description on a virtual carousel, navigated with a simple finger swipe. By establishing this partnership with AFTER-MOUSE.COM around Microsoft technologies, we have looked to offer our customers the best of the new technologies. We have really been impressed by the attention and reactivity of our partner. This experience has also been eye opening from an imagination standpoint and a proofing of just where technology is in our industry. I trust we will embark on many solutions for the betterment on bringing this technology to millions of people. Our dream has become reality. Thanks to AFTER-MOUSE.COM, we have developed a new sales approach based on an innovative, futuristic tool, and strengthened our concentration on customer satisfaction. Multimedia technology is of great interest for the sales side of our business. 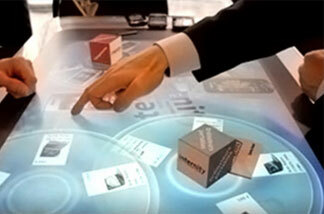 Touch screen units will allow our customers to be immersed in their future environment, using 3-D animations. (…) a user-friendly tool which consumers greatly appreciate. (…) this new sales contact makes it possible to create a second sales point (…). This will allow us to double our presence while limiting investment.